The Government’s $10 million Port Phillip Bay Fund is now open and the draft Port Phillip Bay Environmental Management Plan 2017-2027 has been released for public consultation. The $10 million fund will support projects including water quality improvement, foreshore upgrades, dune stability works, amenity upgrades and wetlands improvements right around the Bay and bayside catchments. It will be open to both small and large scale projects, with community groups, non-government organisations, local government and other agencies encouraged to apply (round 1 of the fund closes on 15 February 2017). 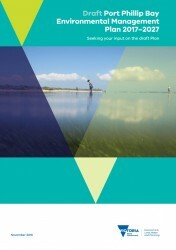 Developed by the Department of Environment, Land, Water and Planning in partnership with Melbourne Water and the Environment Protection Authority Victoria, the draft Plan is part of the Victorian Government’s commitment to ensure Port Phillip Bay remains healthy and resilient over the coming decade. Consultation on the draft Plan is open until 10 February 2017.